Apple is all set to launch the iPhone Xs, iPhone Xs Max and an affordable iPhone with a 6.1-inch LCD screen at an event on September 12. A lot, ranging from probable prices for the next-generation iPhones to their design language and specifications, have been revealed in recent leaks, and more are flowing in. 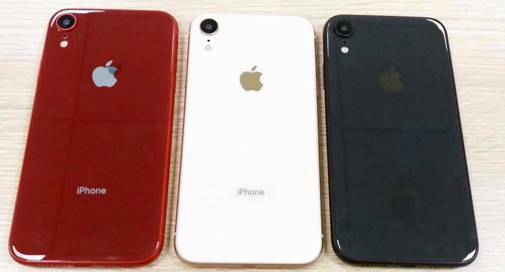 A fresh report suggests that the upcoming 6.1-inch iPhone will come in four colours options and with a dual SIM tray. Image shared by Slashleaks show the new iPhone in red, blue, white and rose gold. Apple has maintained the practise of launching its flagship devices in red as a special edition model. The blue colour will be making a comeback to the iPhone line up after being seen for the first time on iPhone 5c. This will be a darker shade of blue, though. The iPhone Xs and iPhone Xs Max are expected to come in the usual three colour options. The device in the leaked image could be seen with a glass back single rear camera. It is expected to have the same notched screen on iPhone X. The images also show a bit of the bottom edge of the phone with a Lightning jack and speaker grilles. As for the dual SIM tray, it is expected to be placed along the right edge. Speculations have been made in the past about the 6.1-inch variant coming with dual SIM support. Analyst Ming-Ching Kuo, known for pretty accurate predictions regarding Apple devices, had even predicted that the bigger iPhone Xs Max will come with dual SIM support too. Reports suggest that the iPhone Xs Max will be offered in both single SIM and dual SIM configurations, depending on the market and region. Earlier leaks by German website Macerkopf.de indicated that the 5.8-inch iPhone Xs will be priced at 909 euros (around Rs 76,000). The iPhone Xs Max will be priced at 1,149 euros (around Rs 96,000). These will be the prices for the base variants with 64GB of storage. The cheaper iPhone with 6.1-inch LCD display will be priced at 799 euros (around Rs 67,000). The Indian prices are likely to be higher than the European or US prices, and the depreciating rupee could make them even steeper. All three upcoming iPhones are expected to be powered by Apple's A12 chipset. The cheaper phone will come with 3GB RAM instead of 4GB on the other two. In terms of storage, the more expensive phones will get three options; the base with 64GB, another variant with 256GB and the third with 512GB storage. The LCD variant, however, will just get 64GB and 256GB variants. One of the iPhones will be an immediate successor of the iPhone X with a 5.8-inch screen, the second will be bigger with a 6.5-inch screen and the third will be a cheaper, 6.1-inch iPhone. The cheaper iPhone is expected to feature an LCD display instead of AMOLED on the other two. While the 6.1-inch variant will get a single lens setup with a 12-megapixel sensor, the 5.8-inch and 6.5-inch iPhones will get dual cameras with two 12-megapixel lenses. The construction material of the cheaper iPhone is also likely to be different. The 6.1-inch iPhone is expected to be built out of aluminium, instead of stainless steel which will be used with the other two. However, all three will come with a notch and also feature Apple's Face ID.